After a minute of pause, she reacted “don’t you dare give it to Pasta before Pujo and I know she is going to obey her grannies’ wish! She is not as bad as her mother”…. “Maa doesn’t tell me you really believe that having Kul has relation with education.. it is nothing but superstition”…Maa replied “look I think there is something scientific about it to not to have it before month of February and that is why people linked it with the Puja” and I ended on offering her a spoon full of Kuler Achaar “Maa you can now have it; Saraswati Pujo is over”… and that is how our tok, jhal, misti (sour, hot and sweet) fight came to an end with a perfect dose of Achaar. 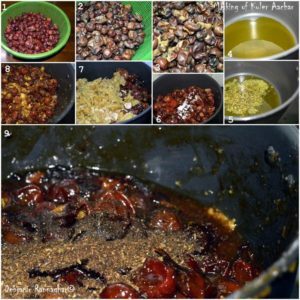 Kuler Achaar or Boroi er Achaar (Jujube is known as Boroi in Bangladesh) is a sweet and sour pickle flavored with the Bengali five spices or Panch Phoron. Almost everybody who is borne and brought up in Kolkata (West Bengal) obviously had the memory of having this amazing Achaar from the vendors who used to seat outside school gates with their spread of Aachar and Hajmi Guli. I have tried to recapture my memory of having the Kuler Achaar from the Street Vendor as well as prepared by some relatives and even neighbors. Kuler Achaar is not something my mother used to make but Mamoni ( my auntie) used to make it every year but to be very frank I was a fan of Achaar prepared by the mother of my tuition teacher and I tried to recall the spices and obviously consulted few Bengali books to prepare the Achaar. Kul is a seasonal fruit and is available mostly from February to April in the Market. 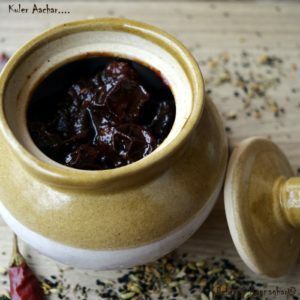 Kuler Achaar can be prepared either mixing the spices and sweet agent with it and then after just sun drying it and in another process the fruit along with the spices and Jaggery cooked on low flame and then seasoned under the sun. I opted for the second methods this time. Though can be prepared with Sugar, however, Jaggery is always preferable since it adds a raw tangy flavor to the Achaar and I opted for Jaggery. I have made the Achaar with 2.5 Kg of Kul this time and ended on having 2.5 jars full of Achaar. I have added whole Panch Phoron as well as a powder of the five spices to my Achaar to get the perfect aroma. 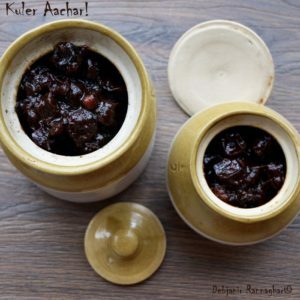 Kuler Achaar is a sweet pickle prepared with Jujube or Kul or Boroi where Topa Kul is cooked with Jaggery and spices. This is a signature, Bengali Pickle. Panch Phoron / whole 5 spices: 1 Tbsp. Cumin Seed to make Bhaja Masala: 1 Tsp. Wash Topa Kul / Jujube under running water and sundry those for 3 consecutive days. I have used a perforated plastic bowl. Cover the bowl a piece of cloth after placing the Kul and then sun-dried. Cut a little slit in the mid of each Kul or just press those to get cracked. Again sun-dry Jujube for one more day. 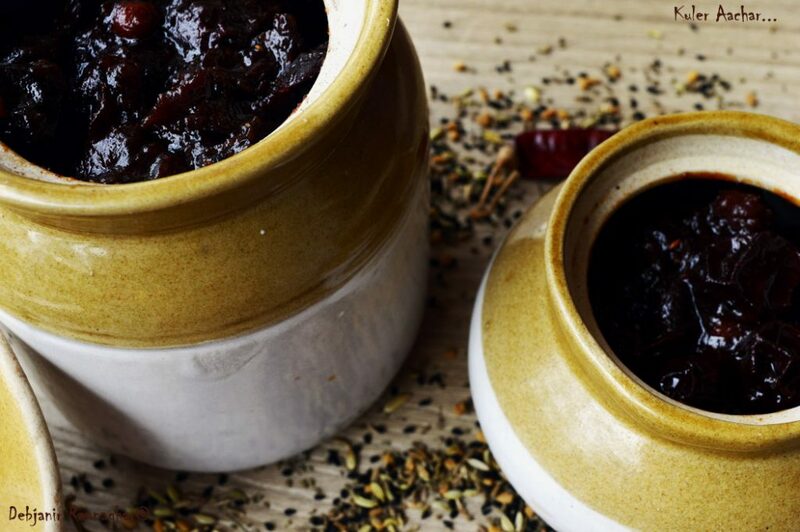 This step is optional but helps to incorporate the flavors and spices inside Jujube properly. Take 1 Tbsp. of Panch Phoron or Bengali 5 spices and dry roast those for 2 minutes in low flame. Cool the spices completely and then make a coarse powder. Following the same process dry roast 1 dry chili and cumin seed. Make a coarse powder of the dry-roasted to make Bhaja masala. Take Mustard Oil in a deep bottom pan. Temper the oil with a dry red chili and whole panch phoron. Now add cracked Kul to the tempering and mix properly. Add Salt and little red chili powder to the mixture and slow cook for 2-3 minutes. Add either liquid or grated Jaggery or Akher gur and give a proper mix using a spatula. Mix properly to get the Jaggery mixed properly with the Kul. Cook for 5—6 minutes until Jaggery completely incorporated. The Aachar will turn a bit liquid at this stage. Add Bhaja Masala powder and Panch Phoron Powder and cook for 5-6 minutes more to reduce the Jaggery. 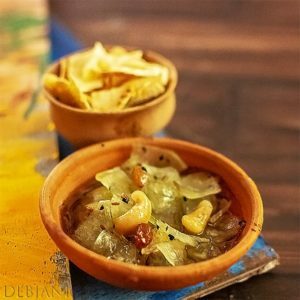 Kuler Aachar should have a semi-thick consistency with a thick gravy of Jaggery. Switch the flame off and let the Achaar cool completely. When the Achaar is completely cooled, transfer it into sterilized jars and close the jars using cap. Place jars filled with Kuler Aachar under direct sunlight to get it processed at least for 15 days. Use a sterilized spoon to take Aachar out of the Jar each time and place jars in Sunlight at least once in a week. Jaggery can completely be substituted by Sugar or a ratio of 1:1 can also be taken. I have used liquid Akher Gur; in case not available Normal Jaggery can be used and that needs to be grated before using. Mom's Tip: More the Aachar processed under sunlight more the taste and more less the chance of the fungal attack on the top of the pickle.